A hot summer’s day is not usually a time I steal away to sip my favourite whiskies, but the cooling effect of the light rain falling as I sit under the eaves on the deck has motivated me to try a couple of Macallan products head to head. This evening’s pugilists are none other than the Macallan Select Oak from Macallan’s 1824 series and the Macallan Cask Strength, reviewed in this pages not too long ago. 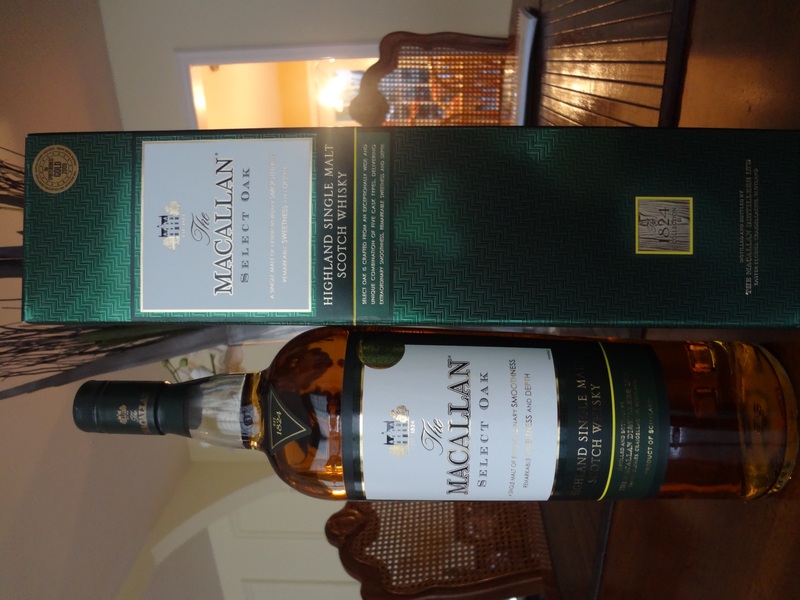 My review of these two Macallans should take place with the usual disclaimer that water was added to the 60% abv Macallan Cask Strength to reduce the alcohol proportion, though only a drop or two was added to the travel retail exclusive Select Oak. The colour on the Select Oak is more pale than the deep shade of the Cask Strength. The elegance of the gold colour on the Select Oak is contrasted with the bold if not aggressive amber of the Cask Strength. The softer nose on the Select Oak asks for recognition of its light fruits, honey, and gentle cinnamon and spice. The nose on the Cask Strength calls to attention a bold statement of oak, strong fruits, including orange, chocolate, and caramel. No nonsense on the Cask Strength, this is a whisky that is looking for trouble, and in my case has found it! The palate on the Select Oak, with its grainy texture and butty core, requests notice of sweet fruits and cinnamon. The Select Oak demands immediate notice of its oak, apple, fruit, honey, noix de grenoble, caramel, cinnamon swirls, and strength. This Cask Strength is a heavyweight contender and is not shy about its intentions. The finish on both are long, smooth, and flattering. The Select Oak ends as it started, softer than the Cask Strength and fading into memory of sweet fruits. The Cask Strength is more durable, keeping up the fight with spice, orange, and oak. Overall, the winner is the Cask Strength. Though price points are higher on the Cask Strength, the whisky is fuller, more complete, complex, and flexible. This edition of Whisky Showdown! has us exploring two different products from the same distiller. An exciting tasting which should lead us to discover how the two different production methods compare and contrast. The two products in question are Macallan 12 and Macallan Select Oak. The Macallan 12 is a sherry oak product. The oak used in making the casks that will age the whisky are from the north of Spain, specifically the forests of Galicia, Cantabria, and Asturias. The wood is air dried in the north of Spain before being shipped south to be toasted in Jerez and turned into casks. These casks are then used to produce dry oloroso sherry. After 18 months aging sherry, the caks are emptied and sent to Macallan’s distillery for use in its whisky production. The Select Oak is part of Macallan’s 1824 Collection and available only at travel retail sites. This whisky is aged in three different cask types, Spanish sherry oak casks, American oak casks that held sherry, and American ex-bourbon oak casks. I am not sure how long the aging process is for this whisky, though I expect it to be less than the 12 years of its challenger. Both are similar in legs, having thick legs that run rather quickly. The Macallan 12 is darker and richer in appearance than the Select Oak however, making it easy for me to distinguish them as I go through this tasting. The nose on the Macallan 12 is full of sherry while the Select Oak brings out intense orange, cinnamon, spice, and vanilla. Some other fruit is also apparent in the nose of the Select Oak. The Macallan 12 also has some faint hints of orange, but it is more smokey and dry overall. On the palate, the Macallan 12 is more sherry, smoke, oak, dried fruit, and hints of orange. The Select Oak has cinnamon and spice, sugar, citrus, and dried fruit. The Macallan 12 finishes smoky with wood and spice. It’s dry overall, but has some faint hints of dried fruits. It lingers for quite some time. The Select Oak is sweeter and less long lasting, but not to say less satisfying. The sweetness is very nice in itself and hugs the tongue as it works itself through its stages. Overall, I’ll give the Macallan 12 the slight edge overall. It is more complex overall and an interesting experience, but I like the sweetness of the Select Oak quite a bit. Depending on my mood, my overall rating could change, but on this cold November evening I prefer to the Macallan 12’s smokey, oak filled tasting experience. The Select Oak is harder to find of course since its distribution is limited, but I strongly recommend purchasing both. The Macallan 12 should be purchased in New Hampshire if you happen to be going through as it is easily less than half the price than in Quebec and Ontario. For my full review of the Macallan 12, click here and you can find my review of the Macallan Select Oak by clicking here. Recently, a friend’s travels took her through Chicago. Being in good terms with me and appreciating my thirst for good whisky, she retrieved a bottle that is exclusively sold at duty free shops. I decided to open this bottle today, though I’ve had it for a while. 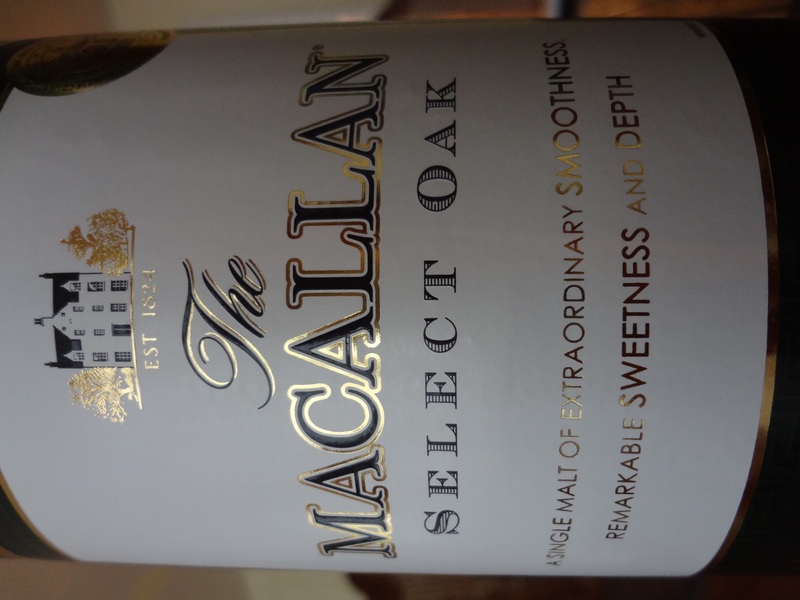 The Macallan Select Oak is part of their range geared specifically for travelers. It is only available at American, European, and some Asian airport duty free shops. This whisky is aged in mostly first fill sherry oak casks, but American oak used for producing bourbon is also used. This 40% abv whisky is golden, with thick legs that also happen to run rather quickly. On the nose, it’s orange, spice and cinnamon. There’s some apple, pie crust, and hints of pear. On the palate, remarkably smooth. Cinnamon and sugar are omnipresent but joined periodically by oak, very light hints of smoke, apples, pears, and green grape. The flavour profile makes for an easy drinking whisky that could appeal to a broad range of people, from beginners of whisky appreciation to seasoned pros. The finish is not short, but I wouldn’t call it very long either. It’s satisfying, with the cinnamon and spice continuing its hold on the senses. It ends sweetly and lingers on the sides of the tongue for some time. Overall, a fine daily dram and better than your average whisky. It’s lack of complexity precludes me from calling it an excellent whisky, but it is perfect for a warm summer’s day or casual drinking after a pleasant dinner with friends. In other words, a versatile whisky. Well worth picking up on your travels and an interesting find for those looking for something easy to drink under many circumstances, I guarantee this will be a bottle you will be sad to see reach its bottom.